Along those lines, the below poem began shortly after completing this watercolor. It is inspired by a few things: my time traveling in Morocco; a book by Titus Burckhardt titled, Fez, City of Islam; which I read during my undergraduate architectural thesis for a design project in Fez; and the process of completing this painting and reflecting on it afterwards. A threshold between past and future. giving it the magic and lure it emits to this day. continue to give this city the meaning it once did? Will they remain the pulse that was once the lifeblood of the city? something different, more 'modern', more for the outsider? There is mystery behind its closed doors. What lies before in sharp contrast to what lies beyond. now stand as invitations to enter leaving notions of space and time aside. strikingly contrast its light filled courtyards. brimming with scent and simple luxury. All hidden from public eye, as if protecting innermost longings. is a constant reminder, a constant celebration of dreams and awakening. For the traveler it is revealing and eye opening to encounter this. Forever instilled with the longing to become one with desire. Morocco...I recall traveling through the desert and catching glimpses of nomads in miles and miles of what seems like nothingness to us, but is home to them. As if suspended in a different time. Where did you come from? Where are you going? Perhaps these are projections of our own way of living that do not translate to the desert life. Their language is not our language and we must pique our curiosity from a respectful distance; through the windows of our luxury buses which to them do not exist. It is from here that we arrive in Fez, the maze, the puzzle. It is within its captured gems of air and light filled courtyards that we suddenly find ourselves lightened just like the nomad. But only for a moment until we leave again and enter the frenzy. If you enjoy my travel inspired art and writing, be sure to subscribe to my watercolor inspiration journal here. It is here that I give a private and intimate glimpse into my studio, and my journey. I look forward to seeing you there. A geometry displaying expertise in mathematics and proportion, as well as a sense of affinity towards infinity, the universe, and the divine. A harmonic coexistence of discipline and the ethereal. Interested in Fine Art prints of my artwork for your home? Be sure to subscribe to my watercolor email journal here to hear about the launch of my online shop. 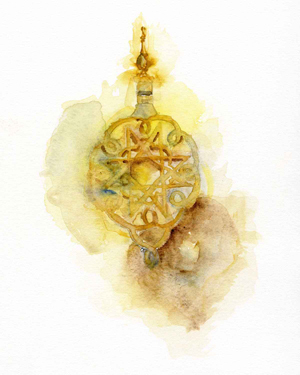 Subscribers also receive a new watercolor image in each issue which they may print for their homes. Hope to see you there.